If you’re searching for a way to lighten up any party, an inflatable costume might just do the job. Regardless of who wears it, it will put a smile on everyone’s face and will take your gathering from dull to nice memory. Such an item can be used regardless of the occasion, whether it’s for having fun with your kids on a weekend or for school parties and similar events, so it’s never a waste to have one to save you from any situation. 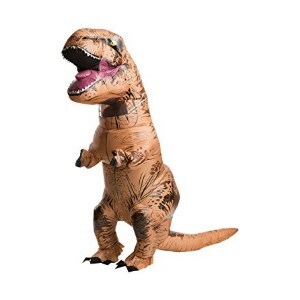 Made entirely of polyester, this inflatable costume resembles a T-Rex and is wide enough to fit a grownup comfortably. It’s officially licensed by the Jurassic world and can fit a 42 to 44-inch jacket size, meaning it’s probably a little too wide to be worn by children, but it will still be the star of the party when worn by an adult. A battery-operated fan keeps the interior dry and ventilated so that the costume is comfortable to wear, considering the fact that the material can get a little overheated. It works on four double A batteries that you can easily find at any local hardware store. This particular alternative is a great idea for all those time when your kid’s schoolmates come over for an anniversary or whatever event, and you need to keep them entertained. Inspired by a movie loved by many, this costume will be instantly recognized and will put a smile on their face. The costume itself fits a 42 to 44-inch jacket size, which means it’s fit for an adult with regular measurements. The packaging includes an inflatable costume, a jumpsuit to be worn underneath and gloves to complete the outfit. It’s powered by batteries, but they’re not included in the delivery box. This option is great for all sizes and ages since you can choose the appropriate fit according to your body measurement. 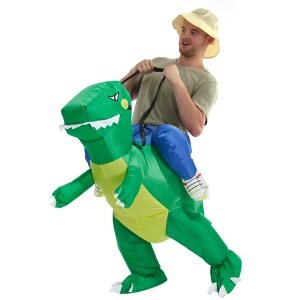 The costume itself gives the impression of a ferocious animal such as a dinosaur giving you a piggyback ride. In order to be inflated, it requires four double A batteries that are not included but can be purchased at any local store. It can be a bit difficult to inflate this costume, but luckily for the customers, instructions are included. All you need to do is tighten the outer ring to properly hold the fan in its place and turn it towards the front when you want to inflate the head. This 1.18” high and 2.76” wide costume can easily fit a grown man inside, and will likely become your go-to solution whenever you have children over, and you need to keep them entertained. The package contains the inflatable jumpsuit as well as the headpiece and the gloves that complete the outfit. A battery operated fan helps you inflate the costume, so it’s easy to put it on, and you probably won’t need any further instructions. 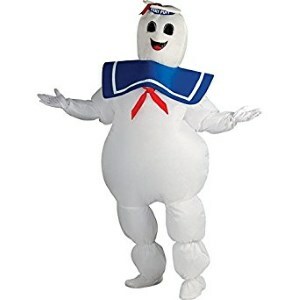 Just remember to get a full set of Ghostbusters costume for your friends and family to create a fun thematic group. 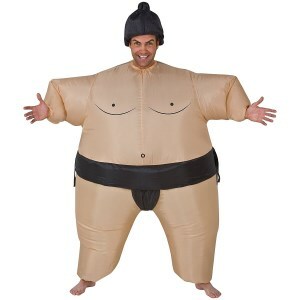 A costume that’s 45 centimeters high and 35 centimeters wide is fully inflated after sixty seconds and can fit a regular size adult. Unfortunately, it doesn’t come in any children’s sizes, so you’ll likely be the one that has to dress up for the next party. The sumo hair featured in the photos is not included in the packaging, so if you want to complete your outfit by wearing the wig as well, you have to purchase it separately. Powered by four double A batteries, this costume also includes the fan used for inflating it. If you’re a big fan of the film, you’ve probably always wished to show up at a local party dressed up as one of the beloved characters. 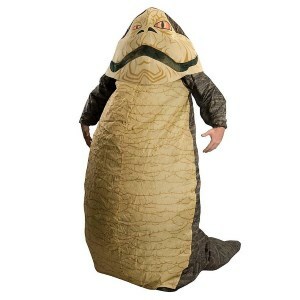 Well, using this inflatable costume from Rubie’s, you can now impersonate Jabba the Hutt by wearing the full-body inflatable jumpsuit. If you’re feeling daring, you can go a step further and wear the headpiece as well, to complete your disguise. Take care though, because costume sizes are different than regular clothing sizes, and you need to make sure you choose the one that’s appropriate for you by consulting the size chart. To inflate this piece, triple A batteries are required. 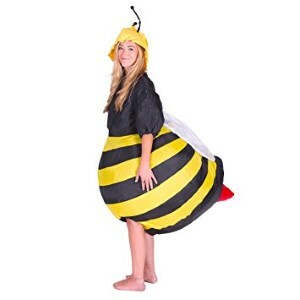 This adult size bee costume is not only fun but can also be used for educational purposes. It’s great not only for individuals, to be worn at parties or events that require certain outfits, but also for school classes that teach kids about nature and the importance of even the smallest animals. It comes in one size that fits most body types and is powered by four double AA batteries that you have to purchase separately. A fan is also included in the packaging, and it can inflate the costume in a matter of seconds, making it easy to put on. 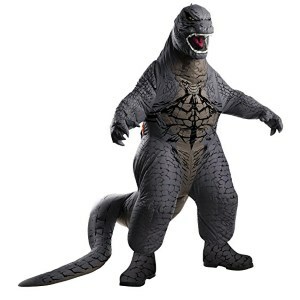 A costume that comes in a standard size but that can fit most adults, this Godzilla interpretation is likely to scare anyone at a Halloween party. If you wish to attract all that attention, go on and try this alternative. It’s made entirely of polyester windbreaker fabric and features a back zipper in order to be easier to put it on. Tiny areas of elastic materials have been added at the neck, sleeve cuffs, and ankle cuffs to make the costume more comfortable. Aside from scaring your kids with this costume, you can also try to lighten the mood at any party by showing off your dance skills dressed as Godzilla. Works every time. If you want to look like the Grim Reaper has his hands around your neck, this Halloween costume surely does the job. Perhaps an unusual choice, but still popular for this holiday, this alternative features an inflatable Reaper hugging you from behind, which will instantly make you the star of any party. 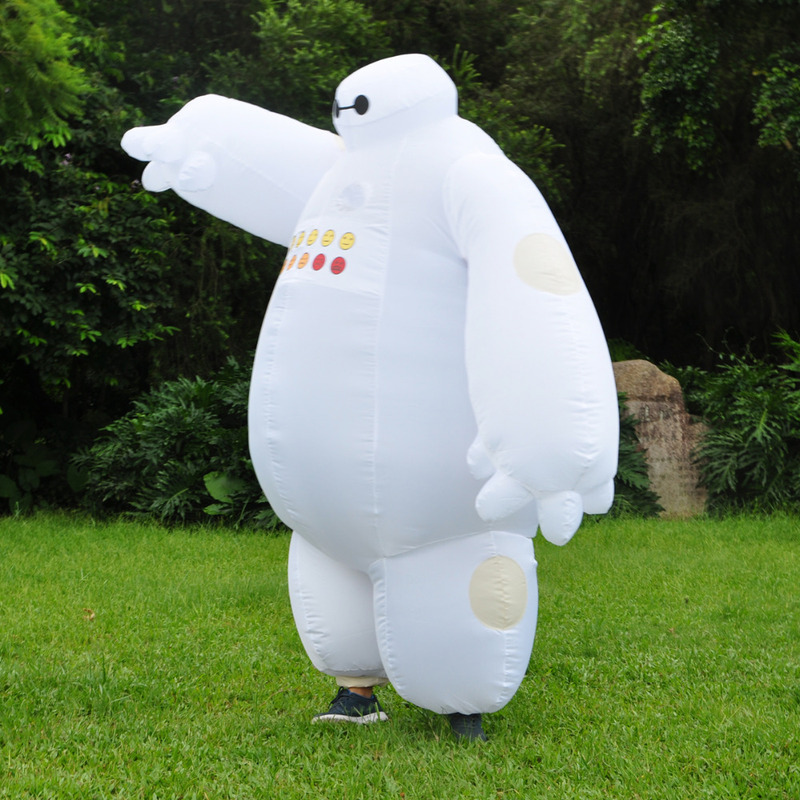 The costume can be inflated in just a couple of seconds by using the included fan. It only comes in one size, but it’s wide enough to fit a regular sized adult inside. Really affordable too, this alternative will turn you into the attraction of the Halloween party. If you’re a star wars fan, chances are you can’t wait to show up to the next Halloween party dressed up as one of your favorite characters. 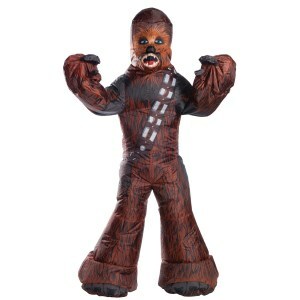 Well, you can now do that by using the inflatable costumes from Rubie’s, particularly this one that resembles Chewbacca. A beloved character and a great costume choice, this full-body suit comes with a battery operated the fan to help you inflate it much more quickly. Triple-A batteries are needed to do the job, which you have to purchase separately. To get the right size for this costume, make sure you check the chart first because costume sizes are different than regular clothing. Getting the best inflatable costume might not be all that challenging if you’ve made up your mind about what you want to be this Halloween or plan to dress up for some other occasion or event you’re going to attend. However, since the market is overflowing with choices, sometimes you might be tempted to go for one or the next, and therefore end up feeling just a bit baffled. Some models cost more than others, which is understandable seeing how they might be made of better materials. The size of the product also needs to be given some thought to, and it’s quite likely that a bigger one is pricier, what with a lot of material going into its design and build. In most cases, though, a quality unit can cost as little as thirty dollars or even less, if you’re particularly lucky to get it when it’s on sale. Keep in mind that, the cheaper the choice, the less likely it is for it to withstand the test of time. Nonetheless, since even new dragon costumes lose their charm after having been worn once, you may want to get a fresh choice every season. Good times are spent in the company of friends and family, and what that means is that your looks for Halloween or any other events have to be on par to make sure that everybody enjoys themselves. Check out the following guide on the best inflatable Halloween costumes if you want to make sure that you are able to make the right decision. Depending on the model you intend to spend your cents on, you’ll notice that some come in universal sizes and others are sized differently as per the body shape and features of various consumers. While some universal alternatives might do the trick, we suggest you think twice before opting for one of these. 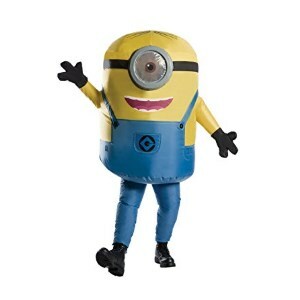 Remember that an inflatable costume has to go around your body and fit it as best as possible so that you can remain comfortable all throughout the hours you are going to wear it. Besides, if it is too wobbly or runs too small, it might not look right on you. Since these are inflatable choices we’re talking about, they’re usually manufactured of synthetic fabrics. These materials usually do a good job when it comes to withstanding the test of time, although they’re not impervious to things like forks and any other pointy items. Something you should pay attention to if you are focused on getting a comfortable product is the material that goes right next to your skin. It’s often that, with bulkier costumes, you might end up feeling sweaty. As such, we suggest checking whether or not the fabric that will touch your skin or the clothes you’ll wear underneath the costume is breathable. It goes without saying that the reason you are in the market for an inflatable costume in the first place is to have fun with it. However, some models are designed differently, in that they look more unique compared to others. A typical inflatable fully bodysuit costume doesn’t look all that impressive. It usually comes in a certain color and is round, funny, yet less comfortable than other choices. There are also alternatives shaped and painted like dinosaurs. What’s more, with some options, you don’t have to cover your body in its entirety. 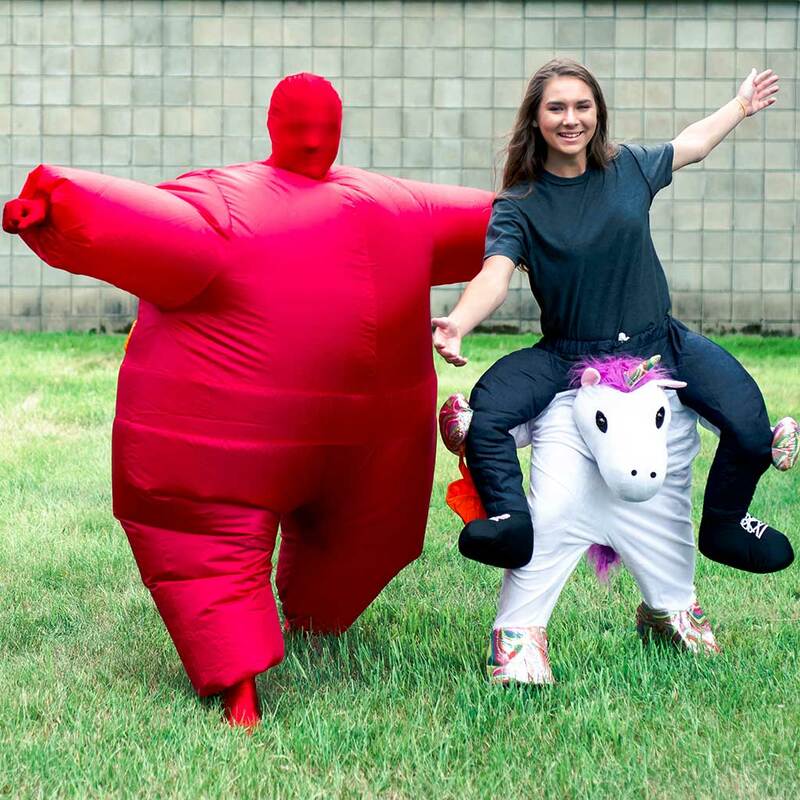 You can go for a blow-up costume that looks like you’re riding a chicken or even Donald Trump, although the latter might be a bit risqué if some of your friends have Republican views. For one night, you can even ride a unicorn, a mule, or look like you’re sitting on the toilet, minding your own business. Some full-sizes choices are made to be either funny or scary. That’s why dinosaur costumes are particularly popular with children and adults alike. You can even don the looks of King Kong for one evening, or be a Sumo wrestler if that’s what you want. Besides, an inflatable Grim Reaper costume can make you give the feeling like you’re being held by Death himself. Some of the models you are likely to come across are fun and all that, but they don’t look like a particular character. That’s not the case with costumes shaped and designed like Spongebob or any other famous book or movie hero. You can be Godzilla, Super Mario, or a Minion for one night of your life. Who are you getting it for? It’s rather easy to know what you’re after if you intend to get the costume for yourself. Choosing one for another person is something else entirely. You need to make sure that you go for the right size. The age of that individual should also be considered as children tend to be in tune with loads more characters from movies, cartoons, and even books, at least when compared to adults. While a Star Wars inflatable costume might do the trick for someone who’s in their 20s, it might mean little to nothing for a tween. Perhaps a tween isn’t even aware of what Star Wars is or just has little to no interest in wearing a BB-8 costume for a whole day. Depending on the materials that they are manufactured of or the quality of craftsmanship, some models can cost a pretty penny. It is up to you to decide whether you are prepared to invest more than one hundred bucks in a quality alternative, as some can come with this price point. During our research, we stumbled upon Pikachu and Godzilla choices that on which you’d have to pay more than $100. In the end, it all boils down to your budget and your expectations in this sense. You can’t expect a cheaply made alternative to last a lifetime, and given the purpose of such an item, it might not even be designed to do that.